The Getty Foundation announced the launch of Conserving Canvas, a new initiative that aims to ensure that painting conservation skills are passed on through workshops, seminars, training residencies, and a major symposium. The initiative’s initial projects support the study and conservation of works on canvas by Thomas Gainsborough, Anthony van Dyck, and François Boucher. 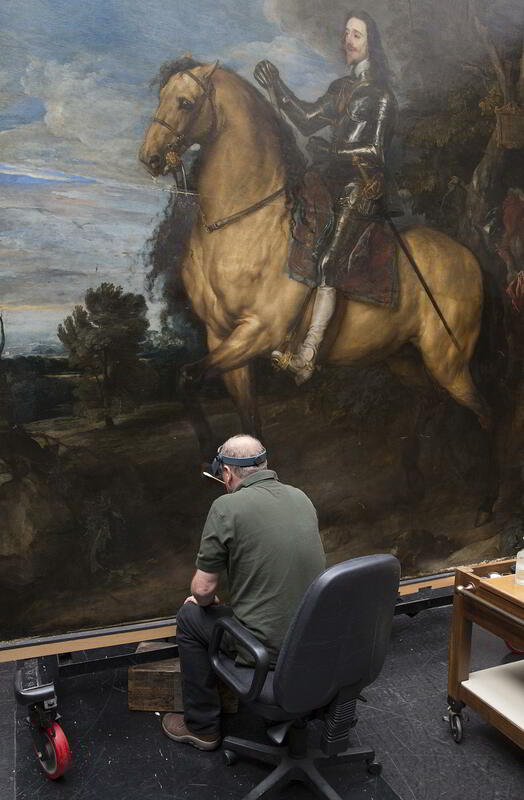 The inaugural Conserving Canvas grantees includes the National Gallery in London for a major conservation treatment of one of the most prominent canvas paintings in its collection: Anthony van Dyck’s Equestrian Portrait of Charles I (1637-8). Another grantee is Sweden’s National Historical Museums which is organizing a thirteen-day collections-based seminar for up to sixteen conservators and curators to study canvas paintings including Jacob Jordaens’s The Return of the Holy Family from Egypt. Stichting Restauratie Atelier Limburg (SRAL) in The Netherlands also receives a large grant to organize an advanced conservation workshop on mist lining, a minimally invasive technique developed to stabilize paintings on canvas.